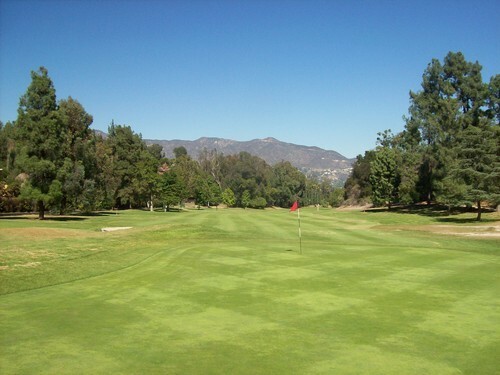 I teed it up here on Sunday. 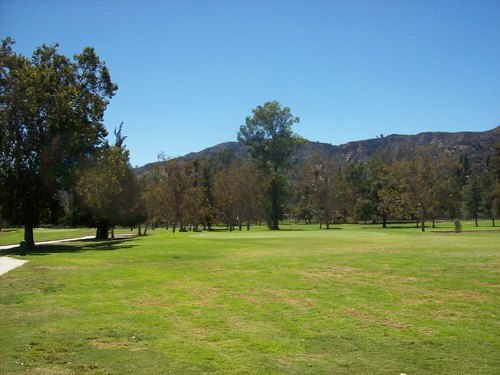 I’m not sure how it came to this, but in all my years of playing golf in Southern California I had never played either of the main Griffith Park courses (there is also a 9-hole course, Roosevelt, located in a different section of the park). 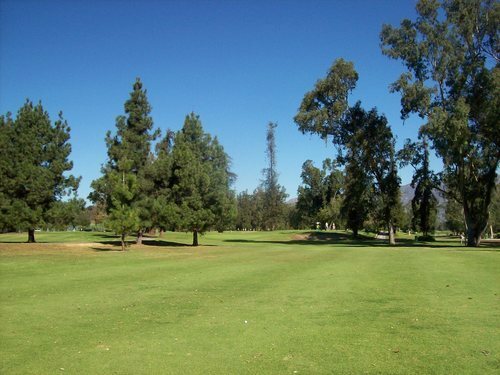 I knew they always get a lot of play, and getting tee times can be tough for us non-LA residents. I hate having to play “wait list” golf if I can avoid it. Unfortunately, I’ll be needing to do that a bit more as I get near the bottom of my SoCal list. Fortunately, I recently discovered that the City of Los Angeles now has an 8-day advanced online booking system for non-residents. And, to my surprise, they allow singles to book! Once I learned about this service, I’ve been anxious to finally get out and play Wilson and/or Harding. Sunday was the day and Harding had the more desirable time available in the mid-morning when I wanted to play. I reserved a 10:00 spot as a single. 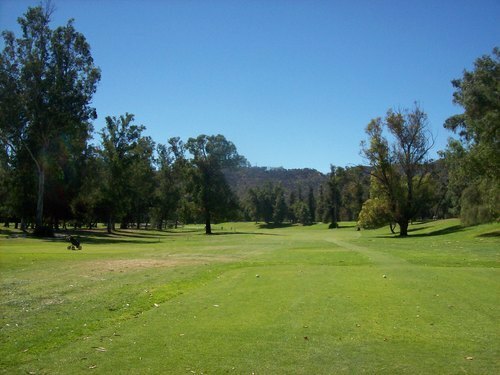 The advance booking does cost $5, which is too much, but it was worth it to me to have a guaranteed time rather than braving a weekend round as a walk-on. The advanced booking didn’t matter too much, though. When I got there around 9:15, it actually wasn’t that busy at all around the clubhouse area. When I checked in with the starter, he said I could wait until my time or there were plenty of other options earlier. Then, he said I could go ahead and head up to the first tee right away if I wanted. A twosome had just headed up there and I could join them. I took that option, paid the $40 walking rate and rushed up to the tee box. We were teeing off a few minutes later. Even though getting started was surprisingly simple and quick, the course was still quite busy. We moved along at a reasonable clip, waiting a little on most shots, yet finishing in about 4.5 hours. I was very happy with that pace considering some horror stories I’ve heard about these courses over the years. The layout starts on a nice note, with an elevated tee box. Two deer just happened to prance by right in front of us before we teed off, which was a pleasant greeting. 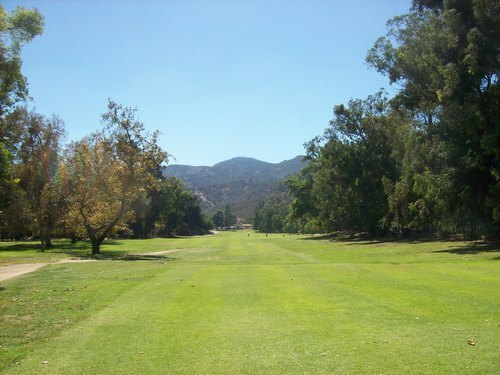 The parkland setting here is very nice and driving in through other parts of Griffith Park on the way to the clubhouse was cool. 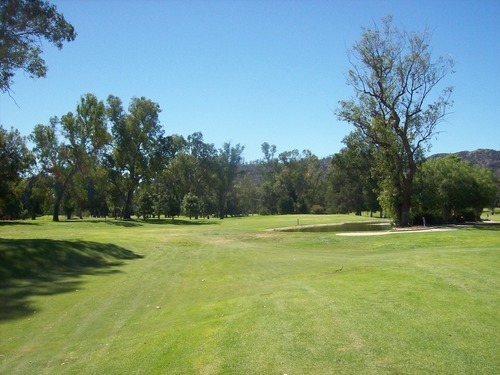 There are lots of pine trees and rolling hills to provide a wonderful backdrop for both courses. 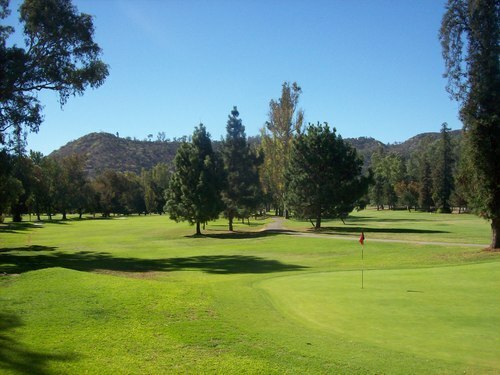 There are a few holes on the back nine of Harding that border the loud I-5 freeway, but otherwise the setting is great. There’s nothing too noteworthy about the Harding layout. It’s a solid course with some old school charm. 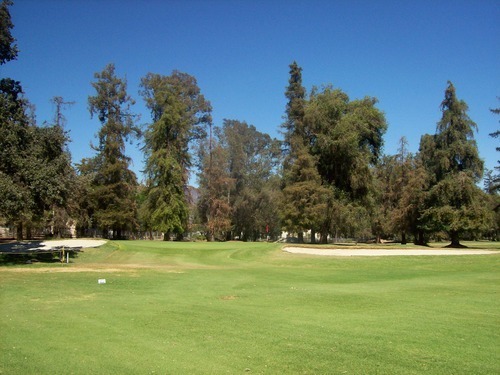 Each hole is lined with trees and directly frames where to aim your shots. 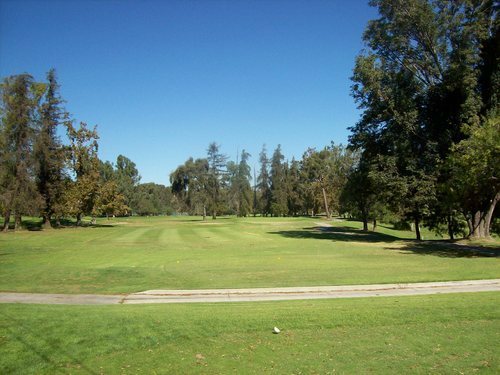 It measures just over 6,400 yards from the blue tees, but doesn’t seem to play as long as that. 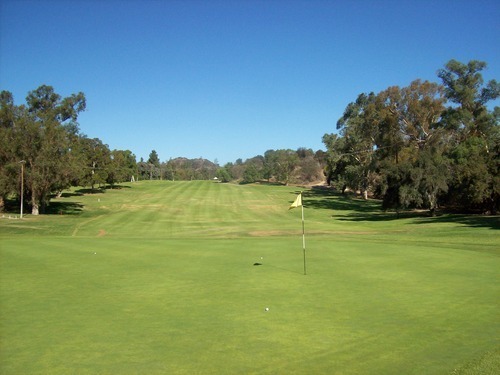 There are only three par-3s and three par-5s here, which is a little odd. 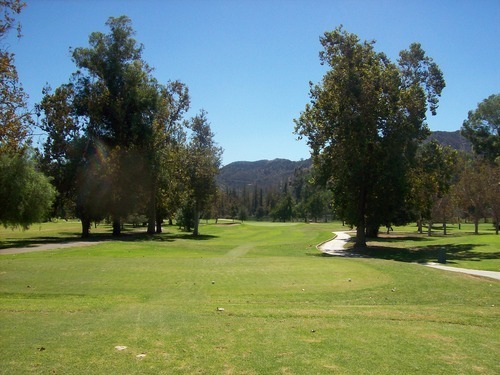 I think the hole I liked most was the finishing 18th hole. 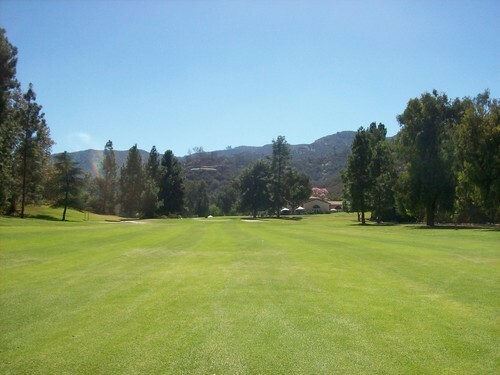 It’s a pretty straightforward par-5 that plays slightly uphill all the way. When standing on the tee or looking back from behind the green, it’s just a nice-looking hole even though it’s a very simple design. 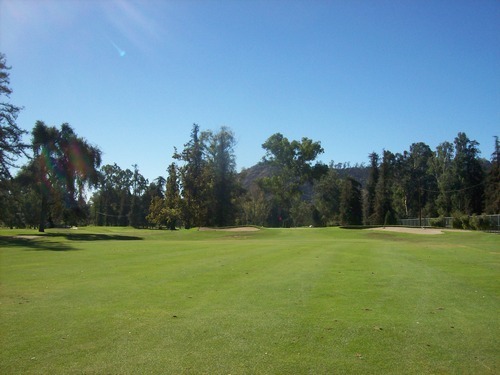 A small hillside lines the left side of the fairway. The right side has some trees, and then beyond those trees on the other side of the fence is the famous LA Zoo. You can hear some of the wildlife next door and that’s kind of fun. 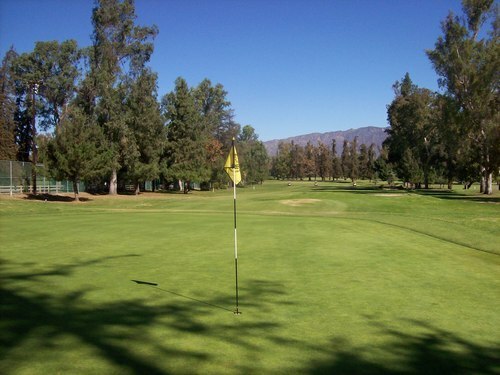 Other than the greens, which I thought were excellent, I was a little disappointed with the conditions. 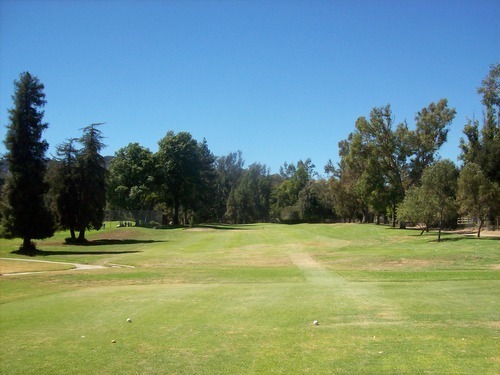 The course was in average or maybe even a bit below average “muni” shape from tee to green. 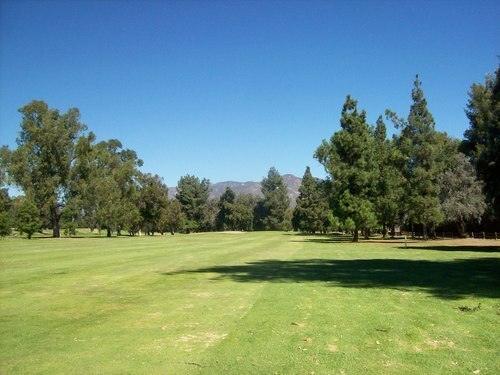 The fairways and rough were pretty spotty and inconsistent, yet I always ended up with decent fairway lies. I did encounter a lot of overly-wet mushy/muddy spots in the rough. Those areas weren’t pleasant to hit from. I found two bunkers. The first was fantastic (on #2) and the second (on #15) was quite crusty and not too great. However, the greens were fantastic I thought. 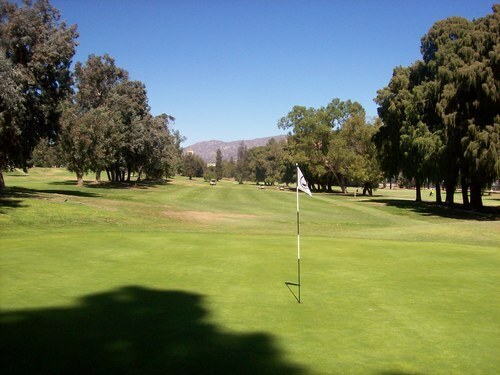 They were soft and receptive, while rolling smooth and fairly quick on putts. I did notice a few unrepaired ball marks here and there, but no more than I encounter on most other courses. 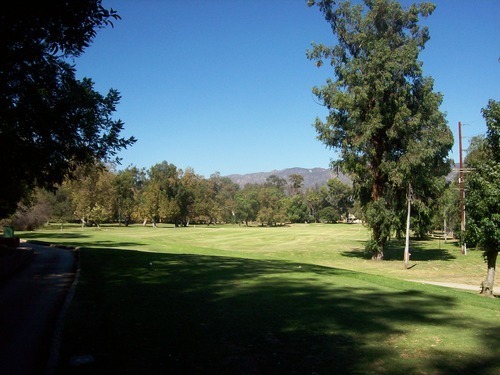 In fact, they were very well-kept for a city-owned course that gets as much play as Harding does. 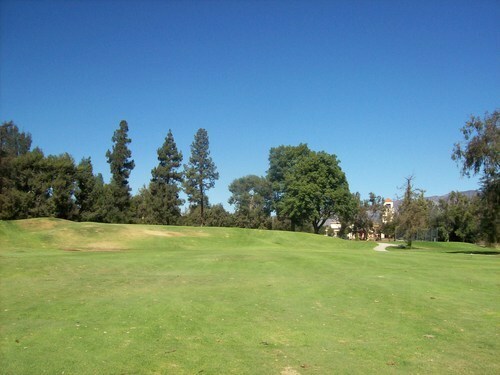 I definitely enjoyed my round at Harding and it was a perfect day for golf in Los Angeles. For me, it’s a bit too inconvenient (crowds, location, etc.) to play all the time, but it’ll be worth a visit from time to time. From what I could see of the Wilson course (and from recent reviews I’ve read), it appeared to be in nicer shape than Harding right now. It’s generally considered to be the better of the two courses, as well. 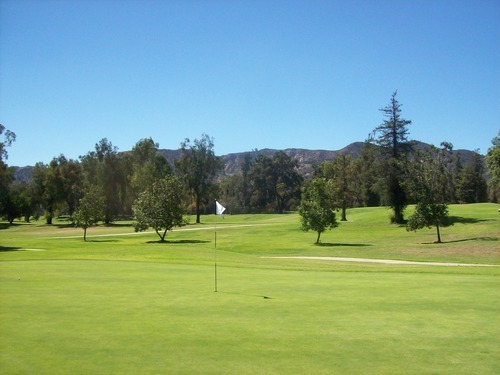 I look forward to getting out there again soon to play Wilson and round out the full Griffith Park golf experience.